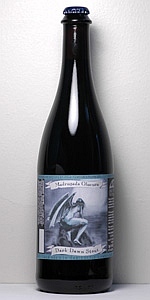 Jolly Pumpkin Madrugada Obscura, 8.1% ABV. Pours dark brown with a slight tan head. Nose is a bit sour. Taste is salty, bitter, and slightly tangy. Decent mouthfeel, overall meh. Does this beer predate Tart of Darkness? Either way, these were the first beers I was ever aware of that were dropping that sour stout style on us. You get a hefty dark pour with plenty of roasted malt giving it the dark appearance with 1/2" brown head on the top. Aroma of sour roasted barley. A little bit of burnt caramel and chocolate. The taste is a neat little lemon sour meets dark roasted malt kind of vibe. Some old oak taste going with it, dropping some wood tannin like vibes into a tight dry sour mouth feel. Minor coffee from the malt notes. A little bit of bitterness, a little bit of smoke noticeable even. This is more of a stout than Tart of Darkness, but ToD has more nuanced cherry cola feels along with that roasted malt and the sourness is also more than just a lemon note, its lemon cherry! Anyways, this is a more expensive, less awesome version of Tart of Darkness. Nice when it shows up at a bottle share, but also not what I'm stockpiling in the cellar (like ToD). On the pour this looks like a big stout, with the black pour only fading slightly on the edges to a mahogany brown, and a tan head. The nose is dominated by the funky notes, though some char slips through, but the taste is all about the funk - if that was dialed by a bit, I think this would be really good, but all I got was a decent stout knocked out of the box by funky flavors. I've enjoyed a couple of sour stouts, but this one missed the mark a bit, IMHO. I wanted to love it, but the funk was too dominant, again IMHO. Really nice dark brew with brown head. Way I like a stout to look. Aroma a little funky. Taste is very dry and bretty. Not much stout like characteristics and not sour, just dry and bretty. Ok beer but not quite great in any way. When I tried this, I was admittedly unfamiliar with Jolly Pumpkin's brews. I LOVE dark beers, especially Belgian brews. I payed a hefty $15 or $20, and was REALLY excited to try it. I chilled it, broke out the tulip glass, popped the cork and poured. It looked great. Beautiful dark brew with a dense head. I took a whiff, and the fun was over. It smelled like the garbage can my folks had for grass on a hot summer day. I took a swig, and it tasted like a cross of blood and vinegar. One more sip was attempted, and the rest was dumped down the drain. Since then, I've learned that JP tends to lean toward sour beers. This was my first experience with a sour. I can't say that my future experiences went any better. This is a very dark brown to black beer. A slight, quick head leaves a fine ring of lace on an Antiek snifter. Oak aromas are strong, followed by tart alcohol. Warmth brings out cherries and vinegar, similar to a Flemish Red. Initially quite tart, sweetness comes into play with cherry flavors. Oak is present throughout the middle as is light roast and chocolate. The finish is long and tart with a slight bitter bite. Super dry, the finish pickles the palate. Otherwise it is soft with a soft full body and light carbonation. Somehow, it seems inappropriate for an Imperial Stout to be sour. Whatever the classification, this is a tasty and contemplative treat.